About Organization: Till the end of the year 1954 there was no formal recruiting agency in the state of Jammu and Kashmir. A Public Service Recruitment Board was set up on December 31, 1954. 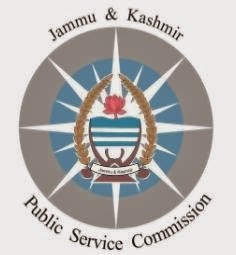 Subsequently with the coming into force of the "Constitution of Jammu and Kashmir State" on 26th of January 1957, "Jammu and Kashmir Public Service Commission" was established, under section 128 of the Constitution of J&K, on September 2, 1957, with Major General Yadev Nath Singh PVC, as it is first Chairman. Qualification: Post Graduate with NET/SLET/SET or Ph.D.
How to Apply: Completed application in all respects with photo-copies of documents must reach “The Secretary, J&K Public Service Commission, Polo Ground, Srinagar/Resham Ghar Colony, Bakshi Nagar, Jammu” on or before 14/01/2014 in an envelope provided by the Commission along with the Application Form.